What Is the Respiration of a Jellyfish? Jellyfish, or Scyphozoans, have no structures dedicated for respiration or circulation. However, they still need oxygen, just like every other animal. 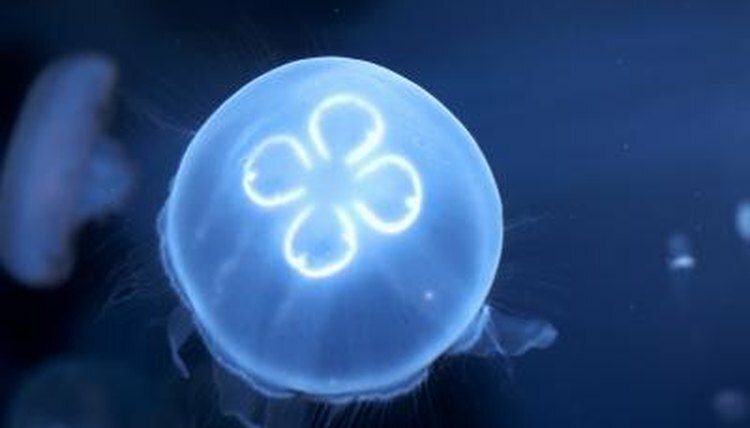 They do have several physiological adaptions that allow them to take up oxygen, and even store it, allowing jellyfish to survive in low-oxygen conditions. The word respiration can refer to two different processes. First, respiration can mean the process an organism uses to procure oxygen. This can include breathing or moving water over gills. Additionally, the process of using oxygen at the cellular level also can be considered respiration, sometimes termed "cellular respiration" to avoid confusion. Jellyfish have such thin tissue that they can get most of the oxygen they need from diffusion without any specific type of respiration. The thin tissue in a jellyfish makes it easier for oxygen to diffuse into their cells. Their bodies consist of an outer layer of tissue, called the epidermis, and an inner layer of tissue, called the gastrodermis, which lines their blind guts. The two layers of tissue sandwich an elastic, jellylike substance, called the mesoglea. The mesoglea consists of nonliving material secreted by the living tissues and requires no oxygen itself. This means jellyfish tissue requires very little in the way of oxygen. Unlike humans, jellyfish have a two-way gut. This means they take food in, digest it and expel it through the same opening. The inner space of the gut is called the coelenteron. The shape of the coelenteron increases the surface area-to-volume ratio for the gastrodermis. This improves the oxygen diffusion, and ensures that the inner layer of tissue gets the oxygen it needs. Despite their lack of a respiratory or circulatory system, jellyfish can thrive in low-oxygen waters. While part of this stems from the fact that they have thin tissue that diffuses oxygen easily and requires little to survive in the first place, the mesoglea also contributes to their tolerance for oxygen-poor environments. The nonliving material of the mesoglea can store oxygen for the living tissues. This allows jellyfish to exploit oxygen-poor environments for food when other animals cannot. What Are the Starfish's Adaptations to Stay Alive?